IT was never easy saying nice things about Adrien Broner. In clearly losing to Manny Pacquiao last weekend, Broner however lost much of what little admiration was left for him, mainly after he claimed he had won the one-sided bout. Broner had displayed partial toughness in the earlier rounds; he was bothering Pacquiao with left-hand flicks, while making neat gliding escapes. Broner was also unwilling to fully engage. 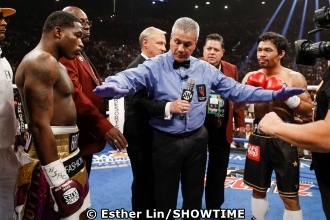 Things started to turn bad for Broner after Pacquiao landed a solid blow to the stomach. From thereon, Broner, composed, started to turn frantic. Maybe Pacquiao was being over-cautious, but the fight took a one-sided route after Pacquaio dug in to give a determined chase. There were at least two instances --in the seventh and ninth rounds—when Pacquiao could’ve claimed a knockout. Pacquiao bared after the fight that his chief handler Buboy Fernandez cautioned him against being careless in digging hard for the kill. Fernandez said they were after all safely ahead on points. How Broner survived to the point of making the ludicrous claim he had won inevitably left a question on whether Pacquiao has truly regained his power and killer punch. Broner has the right to be overjoyed. He finished in one piece, unmarked, which was a lot more than what people had expected. Pacquiao suffered a corneal scratch in the left eye. All told, it cannot rank as a devastating finish for the vastly superior and experienced Pacquiao. Pacquiao, after Broner, has been left to seek a fight among the established welterweight stars, like Keith Thurman, Shawn Porter and Danny Garcia, in order to remain on the elite level. Floyd Mayweather Jr., visibly unimpressed, has declared he’s not interested in fighting Pacquiao again.